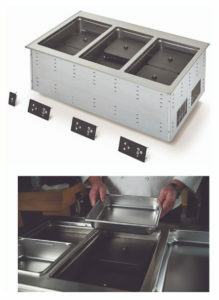 Using induction technology to deliver superior hot food holding and precise temperature control in a water-less well, Vollrath’s Modular Induction Dry Well Drop-Ins can be configured hold one to as many as six wells. Each well contains two induction capsules for two warming zones per well. For added flexibility and efficiency, the zones can operate independently or be synced and run through a single control panel per well. Additionally, each well can accommodate both 2.5” and 4” pan depths with easily adjustable risers on the induction capsules. Cleanup is easy, as the wells can be cleaned with soap and water and the sealed well design contains spills and prevents them from reaching the more sensitive components of the unit. The Dry Well is NSF and FCC certified, UL listed and comes with a one-year warranty.